I have to admit that when I first saw that this was being released, the big kid in me jumped for joy and a small voice in my head yelled: "Buy it!" But, as we already own a knife block in the kitchen I resisted. So my inner child was reawakened when the PR company sent over a set for review. 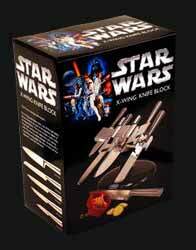 On unboxing I was a little disappointed to see that the body of the X-Wing, which houses the knife blades, was manufactured out of plastic with a chrome finish. It gave it quite a nasty, cheap feel. 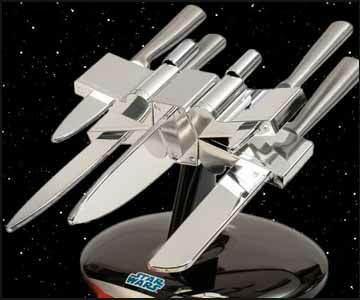 In fact, talking with my son, we agreed it was a bit of a shame, when you consider that the design was plastic anyway, that they didn't design it to look more like an actual X-Wing (with the correct colours and shading) but then I suppose the idea is to make it look like a cool, stainless steel kitchen gadget rather than an exact replica. Putting it together isn't as easy as you'd expect. You need a long, magnetic phillips head screwdriver and getting the screws into the holes isn't overly easy... but stick with it, because once it's all set up it looks fine. And once the knives are safely housed, you realise that the plastic body isn't important, as the knives give it a more solid feel. 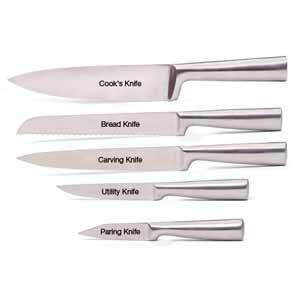 The knives are of good, solid quality, as you'd expect and there's a nice selection (bread knife, carving knife, cooks knife, utility knife, and a paring knife). They fit comfortably in the hand and their weight is spot on too. Even if you don't do too much cooking in the kitchen this is a gadget that is worth investing in. It's solid, very cool and does exactly what you'd expect.